I cannot tell if two of my grandmother’s first cousins came to the wedding, although evidently they sent wedding presents. 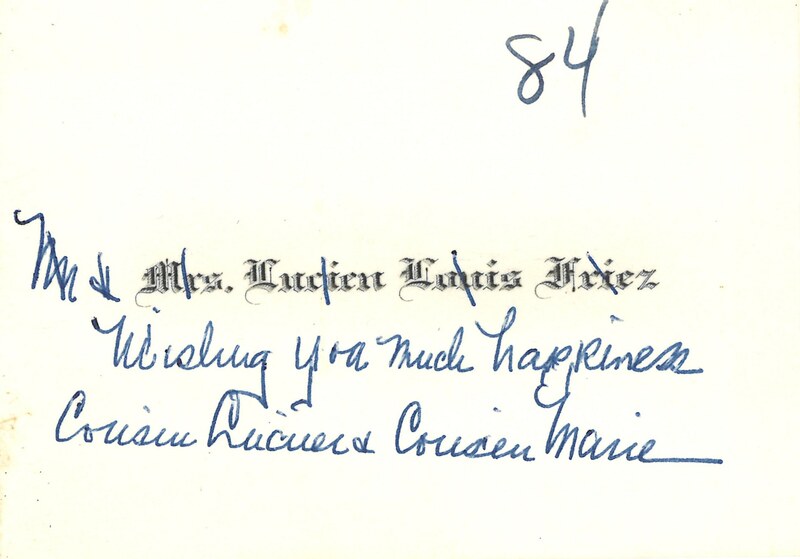 Cards from Josephine Boucher (Stone) Brooks (1889–1965) and her sister Marie Boucher (Stone) Friez (1891–1962) are even numbered consecutively, so perhaps the gifts were exchanged in person, in Baltimore or at my grandparents’ house in Owings Mills. I now know that there were lasting ties between these families. In 1918, my great-grandfather Edward Hughes Glidden (1873–1924) – husband of Pauline Boucher – designed a building at the Belfort Observatory in Baltimore for Lucien Friez. In later years, my great-uncle Ted [Edward Hughes Glidden Jr. (1901–1975)] worked on two houses for the Friezes in Baltimore County: the second, in Ruxton, was illustrated in the 1935 edition of American Country Houses of To-Day. 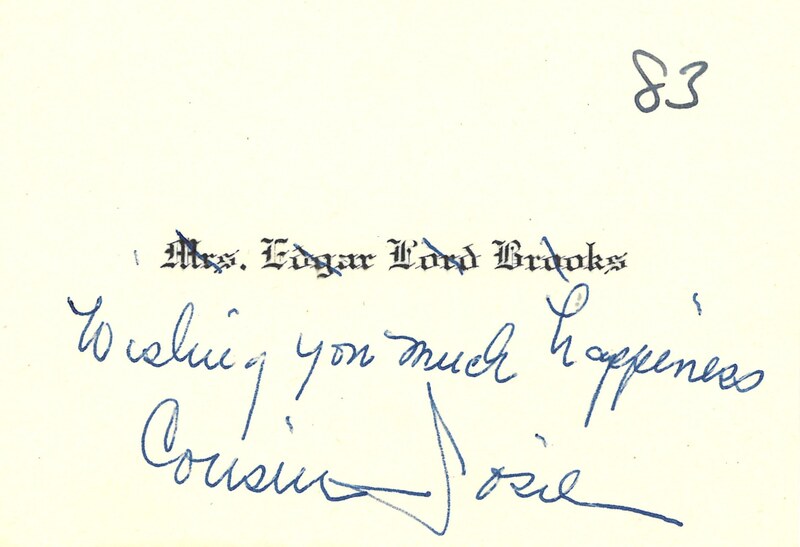 Cousin Josie’s children – Edgar Lord Brooks Jr. (1914–1995), Lucien Boucher Brooks (1917–2006), and Mary Josephine (Brooks) Peters (1923–2009) – ranged in age between my grandmother, born in 1903, and my mother, born in 1932. 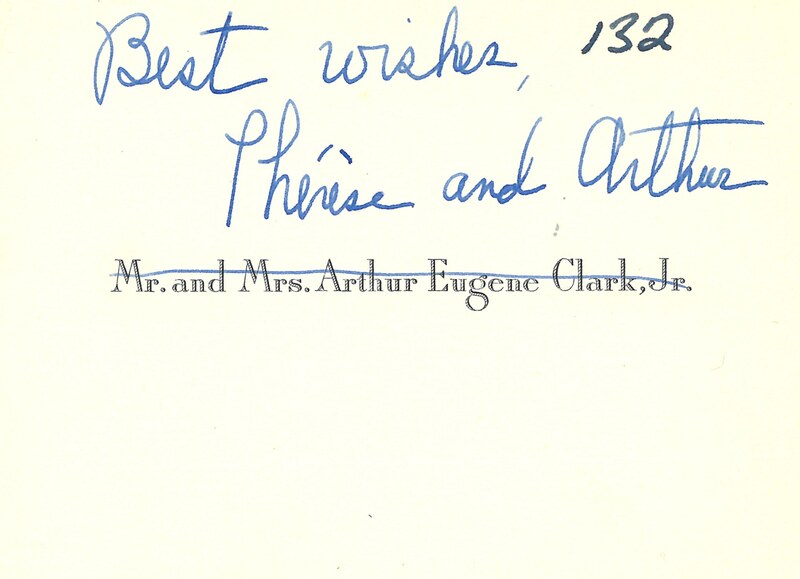 Thérèse Lucienne (Friez) Clark (1914–1999), who like the Brookses was my mother’s second cousin, was close enough to my grandmother, if not my mother, to send a wedding present. Old copies of the Baltimore Blue Book, and recent obituaries in The Baltimore Sun, help me to trace these families. Unlike my mother, who never returned to Baltimore after her mother’s death in 1968, the Brookses, Peterses, and Clarks all retained ties to Maryland, even if they lived elsewhere. 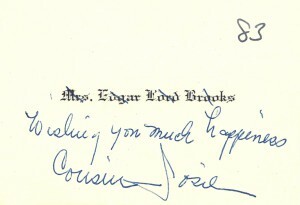 Cousin Edgar and Cousin Lucien Brooks married sisters (Helen and Mary Louise Hiss); Cousin Mary Jo met Wilbur Peters at Johns Hopkins and, following their marriage, moved to Ann Arbor, Michigan; and Cousin Thérèse lived in Anne Arundel County and in Vero Beach, Florida. Their children are scattered across the United States, as far away as California and Hawaii, but many of them, like my Glidden second cousins, are still in the Delmarva region. Boxes and boxes of family letters await me. The family and their connections with wider family and their communities are what takes them beyond the genealogical statistics. I love reading them. 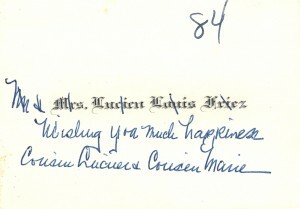 I am lucky enough to have a list signed by all the attendees at my parents’ wedding in 1948. It wasn’t a huge wedding, but there would be no way of knowing who was there otherwise.